I do not own Vash the Stampede, Rem Saverem, Nicholas D. Wolfwood, Milly Thompson, Meryl Stryfe, etc: they all belong to the incomparable Mr. Yasuhiro Nightow. It occurs to me that Vash -might- compose letters in his mind as the way that he re-examines his day, unwinds, and learns any lessons he can from it. This is an attempt to blend the tales in both manga and anime. Anywhere there is contradicting information, the manga's will be used. I use manga dates where they are given. Where dates are not given, I'm using my best guesstimate. As the various "Unwritten Letters" accumulate, there will be more and more spoilers. Wolfwood and I traveled to November, where a mysterious large blade slew many people. It's also the area from which I recently sensed Knives' terrible, murderous anger. As far as I can tell, Knives is much the same now as he was on the day of the Great Fall. He's taller, and perhaps colder. He continues to believe that destroying all humans would somehow solve everything. I know he's mistaken, but, thus far, I have failed to prove that to him. I have no excuse for my own sins. I've always known that it's wrong to kill people, Plant or human. I forgot once, briefly, but you reminded me. I have never completely forgotten it since. I've been tempted, and I've come close to falling into that temptation (especially when I'm angry), but I didn't forget what you taught me. Yet, to my endless sorrow and shame, I have killed. I can't forgive myself for that, so I can't expect that you - or anyone else - would ever forgive me, either. It's different with Knives, though. He's just not seeing all of the facts. Or perhaps he's simply not seeing them clearly. I don't know. I still have hope that he might realize where he went wrong, and change his ways. I still love him, Rem, if not in the same manner as I still love you. Most of the time, I don't want to harm him. I have injured him in the past. Each time that happened, I hated myself for doing it. Each time, it was done because I could think of no other method whereby I might prevent him from killing more people at that time. If I were smarter, perhaps I could have found a better solution. I didn't only do it to protect the humans, as Knives seems to believe. I also did it for him. If he ever figures things out, he won't need more deaths on his conscience. However, I must admit that when I think of all the lives that he's destroyed - including yours - it makes me extremely angry. When I see him, it reminds me of all the people he's murdered. My anger distracts me. I can't think as clearly when I'm angry as when I'm calm. That may be part of the reason why I keep failing, when I try to reason with him. Perhaps, now that I have a better understanding of what I am, it may make a difference. The guilt and shame, from knowing that I am also a murderer, may help me to finally overcome my anger when I see him. I came to November, hoping to learn something that might help me to better understand my brother... as he is now. Maybe if I can understand him better, along with controlling my temper better, I might finally be able to help him get past his irrational hatred of humanity. It seemed worth a try. Anything is worth trying, if it might stop the killing. The place where the bodies were found was restricted. It was also considered dangerous, in danger of collapse. Wolfwood and I had to bribe someone to get in, and be shown to the place where the bodies were discovered. Wolfwood and I followed our guide deep into the ship. Suddenly, that guide grew nervous and started talking about wanting more money. Wolfwood threatened to hit him, which seemed to help him overcome his hesitation. Naturally, I discouraged Nicholas from actually hitting the man. It seemed so unnecessary. However, the threat was adequate. There was no further talk of additional costs. The man showed us to the place where both an unidentified body and a beheaded plant technician had been found. I don't know how to describe it so that a human might understand. I sensed something there, still quivering in that place. It remained from when Knives had been there. I began to concentrate, focusing my attention on that something. Images began forming. The first looked like William Conrad. But surely, that was impossible! He had been on the same ship where Knives and I had lived with you, as children. I had watched from our escape pod, powerless to help, as that ship exploded. For the moment, I set aside the man's appearance along with all of the unanswered questions that boiled up inside my mind. The remote possibility that he might actually have been William Conrad was too distracting. Instead, I continued concentrating. The image began moving, like a video file on a computer. I saw Knives behind that man. I saw my brother pull back his left arm, and I saw those razor-sharp bone blades emerge and extend from his hand and forearm. I saw Knives impale the other man with his arm-blades. Seeing the places where the blades penetrated the man's body told me that the other man, whoever he was, could not possibly have survived. As the images faded, it had appeared as if my brother's attention was directed upward. I turned my own gaze in that direction, and saw a Plant bulb. Within were the remains of a black-haired Plant, who had probably lived her entire life within that same bulb. When I saw the remains of that Plant, my thoughts turned toward Tessla and the time when I saw William Conrad when I was a child. Unlike human children, our bodies had physically matured very rapidly during that year. We looked much more like human children of eight years' age than like a human child of our own age. Perhaps our faces may have appeared slightly younger than an eight-year-old human's might. We had both been walking and talking since we were about three months old. We had also learned to feed and dress ourselves, and take ourselves to the toilet, months before that first birthday. At least some of those things must have been surprising to you... or would have been, if you hadn't seen Tessla. But she had only lived for 229 days - less than a year. You looked so kind and happy, on our birthday. Yet I could also sense sorrow inside of you. Somehow, somewhere, there was sadness... even in your smile. I didn't understand it, not then. The three of us, you and Knives and I, lived among a sea of stars inside a huge manmade pod. Back then, my world was only the three of us and those thousands of sleeping people. After the party, Knives and I went to look at the computer files about the sleeping people. We did that often. Neither of us ever tired of it, back then. One girl's picture caught our attention, so we went to see where she slept. While we stood there, looking at all the sleeping people, Knives talked to me about humans... as he saw them then. "Do you think we can become friends with them?" he asked eagerly. "Yeah," I said cautiously, "I think we'll have to put in a lot of effort, though." "I know," he said softly. "Not everybody is nice like Rem. I know that much. But they're the ones who created Plants. I want to believe that they'll accept us." He wandered off, though I lingered to look at the sleeping people for a while longer. I must have lost myself among thoughts and daydreams. It seemed only a short while later when the alarms began blaring through the ship. I ran back toward where you would be at a time like that, and met Knives on the way. He told me you'd said that there appeared to be an error in the ship's piloting system. He also told me that you had said we should go to our rooms and buckle ourselves in. I did as I was told. Back then, I trusted him. There had never been any reason not to. As soon as I was strapped in, I opened a channel to you and Knives. "What is it, Rem?" I asked. "Listen!" you said. "Lock yourselves in your rooms, and don't come out. Not for anything! Even if you hear people's voices outside, don't say a word!" "What is it?" Knives asked, when you stopped speaking to concentrate on the problem. I was surprised that he hadn't figured it out. "I'm sure Rem's just being cautious," I said, "about our first meeting with other people." "That's right," she said, "Now is not the time! If the ships collide, there won't be any opportunity for meeting other people!" You had told us to be quiet, so that's what I did. I could feel Knives' tension, and I wasn't feeling especially calm myself... even after the alarms all stopped. I guessed, from what you said, that someone would be awakened. I'd seen enough pictures, and read enough histories, to be nervous about what might happen if either or both of us were discovered. I watched in uncomfortable silence as you spoke with the crew in the control room. I felt relieved when the "all green" report came. I felt Knives' relief as everyone left that room. We could no longer see nor hear you. I stayed where I was, obeying your last instructions. I watched the ship's thermal monitors, and knew that you and the crew had gone to another room. I continued waiting and watching, until everyone went to the cryo sleep room. When I saw that the cryo-sleep cylinders were re-activating, I unbuckled myself and went to join Knives in his room. I didn't wait until I saw all of the cylinders activate. I was worried about my brother, and too inexperienced to anticipate any further difficulties or surprises. You also came to Knives' room, and began to scold him. You'd been alarmed by the risk to the ships of being damaged or destroyed. And you were also very worried about the possibility that we might have been discovered. Those concerns made you sufficiently upset that you shouted. We didn't really understand those things, not then. I can understand better, now. How did you know that it was Knives who had tampered with the thruster controls? "Knives!" you said, "You did this, didn't you?" "I'm sorry!" he said, cringing and throwing up his arms as if he feared you would hit him. "I'm sorry! I was just looking at the emergency thruster controls. I didn't think anything bad would happen!" "Fortunately, we were able to stop it just in time," you said, "but this could easily have turned very, very bad!" "I'm sorry," Knives repeated, "I'm sorry!" I have often wondered what you would have said or done next, if William Conrad hadn't interrupted. I saw him first, and couldn't help staring at him. He was only the second human being I had ever seen in person. Did you see me staring, or did you sense someone behind you? You turned around, and, when you saw him, you called his name. He said nothing as he stepped around you and bent to examine us very closely. Reflexively, we both drew back away from him. However, the wall behind us prevented us from backing away very much. "Rem," Mr. Conrad said, "when did this happen?" "It's..." you said, "it's been exactly one year." "I see," Mr. Conrad said. You introduced us to Mr. Conrad. Then you took both of us, and him, to the Earth-like section of the ship where there were trees and grass and a false blue sky and even breezes. The two of you spoke softly for some time. I spent part of that time trying to comfort and caution my brother. When we ran out of things to say, we stopped talking and nervously waited to see what would happen. I wasn't trying to be rude, Rem, but I was worried and curious. I could overhear some of what you said. Knives might have been listening, too. I don't know. I never asked him. "This is a serious violation of the rules," Mr. Conrad said. "The risk that comes from concealing a special case like this... it's impossible to predict. Seriously, it could bring about a fatal disaster." "I know," you said, "but..."
Mr. Conrad sighed. "What do you plan to do with them?" he asked. "Well, I intend to take them into cold sleep with me," you said, "when my period of active duty is done." "I see," Mr. Conrad said. He was silent for a time, and then he walked over to us. "Knives, Vash," he said, "Rem has told me everything." I looked up at Mr. Conrad's face and eyes, worried and wondering about what he might say or do. Knives hunched his shoulders and looked down, away from the man's face. "Um, what do you think?" At first, the question seemed to come from both of us. Then I realized that the voice I heard wasn't mine, but Knives'. "I mean, Mr. Conrad, what do you think... of... us?" "Do you two love Rem?" Mr. Conrad asked. "If you can love someone with all your heart," Mr. Conrad said, "then it's all right. Let's walk on... together." Knives began crying. Almost immediately, he was sobbing too hard to speak. I put my arm around my brother, and let him lean against me. I smiled at Mr. Conrad, and felt heat in my cheeks. It wasn't the first time I had ever blushed, but it is one of the more memorable. "Thank you, Mr. Conrad," I said. Mr. Conrad looked at us thoughtfully for a short while, as Knives continued crying. Then he said, "But you must never touch the flight controls again!" Knives made an inarticulate sound of discomfort and alarm. He leaned harder against my side, as Mr. Conrad walked away. Rem accompanied her crewmate to cryo, where he returned to sleep. I was happy then, and time often seemed irrelevant. So I don't recall with perfect clarity how many days passed, before we again visited the cryo section of the ship. We chose to visit the area nearest to that girl whose picture on the computer had caught our attention. She looked about the same age as we appeared to be. That was probably one reason why we were drawn toward her. Knives and I put on thick, warm coats. We went to one of the observation balconies, enclosed in glass. Even with the glass separating us from the cryo sleep section, it was cold enough to convert our exhaled breath into a visible vapor. "We can work through a few little differences," Knives said optimistically. "If we just talk to each other, we can come to understand each other. Because there's no difference between human hearts and ours. Right Vash?" "I just can't wait, Vash," Knives said. He threw his arms wide, as if embracing all of humanity, as he looked at the thousands in cryo sleep. "Yeah," I said, "Me neither." I was curious, and, in that moment, more hopeful than perhaps I should have been. Then we both saw a girl standing on the opposite side of the balcony, nearer to the exit than we were. "Oi, Vash," Knives said, "Is that her?" I knew he meant the girl whose picture had caught our attention earlier. I checked, and saw that girl still asleep within her cryo cylinder. "No, it's not," I told him. Unlike us, he girl we saw wasn't wearing a coat. She moved through the balcony's exit, into the ship. Curious, we both followed. She led us to a section of the ship we'd never seen before. It was a medical section, somehow independently functioning and capable of being detached from the ship in case of an emergency. Knives went to the computer and began typing, while I looked around. I found a single lily in a vase. Why would a flower be placed there, and so recently that it was still fresh? I knew that you liked flowers, Rem. I wondered what you might have been doing there. I did not yet know about leaving flowers by graves to remember and honor the deceased. After looking around a bit more, and finding nothing else particularly interesting, I asked Knives, "Did you find anything?" "Hmm," he said, as I walked over near enough to peer over his shoulder. "Access is restricted with an unusually heavy encryption." At that moment, the screen began to display "The report of Tessla." "There are so many files... maybe they were doing medical research." "In the middle of space?" I kept looking around, while he continued typing. "Hey, Knives," I said, "Don't you think this room is unusually clean?" "Is it?" he said, still looking at the computer. "The door and hallway looked like they were abandoned," I said, "but here... there's even a fresh flower." Then he found a picture. It showed the same girl that we'd followed there! "What?" I said, moving closer. "Why? Who... which? What does it mean?" "How should I know?" Knives said angrily. "Stop pushing, Vash!" "Next page, come on!" I said. "Read, read, click!" "All right," Knives said, his face contorted with his anger. "All right, I know! Would you shut up already?" His expression made me smile and forget my impatience. Unfortunately, what we found was nothing to smile about. At first, it was exciting. It showed the discovery of another Plant child. That one happened to be a girl. My brother and I were equally amazed. As we continued reading, however, that amazement was transformed to horror. Tessla was subjected to tests, constantly, all day every day. There were pictures of needles, bloody scalpels, and the young plant girl strapped into various machines. Often, she only wore bandages or a blanket, while needles and tubes were attached to numerous places on her face, head, neck or body. I began to feel sick. I wrapped my arms around myself. I didn't want to see any more, but I couldn't look away. I was growing angry. "Someone else was born, before we were? Someone just like us?" There was a sudden grinding of machinery. I don't know if it happened because we read enough reports, or if Knives typed or selected something. Whatever the reason, three specimen cylinders began to rise. I found myself looking away, at the fresh flower. Then, inexorably, my gaze was drawn back to the specimen cylinders. I already knew what I was likely to see, yet the reality was worse than I'd imagined. "Tessla!" Her name poured through my mouth as if it had been torn from the depths of my being. I silently stared past Knives' shoulder at her, unable to do anything else. Tessla's partially dissected right arm floated in a cylinder to our left. Her brain floated in a cylinder to our right. In a larger cylinder, directly in front of us, was the bulk of her remains. Her body had been cut open, and all of her internal parts were floating around her body. Her left arm had been cut off, and parts of it floated beside her body. Only her legs and face were reasonably intact. Knives fainted. And I... I wish I could have cut myself off from everything, too. I tried. I took Knives away from there. I locked us away, in a compartment where I hoped nobody would find us or do those kinds of tests on us. Memories of Knives' hopeful words about being able to work things out with humans mocked me. I had seen what humans do to creatures like my brother and I. It was terrible beyond belief. I expected that we would be treated the same way as Tessla had been. "Only us," I thought, "We're different. We're not like them!" I hadn't thought of us as being so very different, before learning of poor Tessla. I'd known we weren't exactly alike. I'd known that it might take some time and effort - perhaps even a long time and a lot of effort - before we got along smoothly. Yet I had hoped that our differences wouldn't prevent us from getting along... eventually. After seeing how Tessla had been treated, though... she had existed, but she had never been allowed to live. The manner in which the reports were written, with no concern for Tessla's suffering, made it even worse. She had been nothing more to them than a laboratory specimen to be used for experiments. They said she began speaking at the age of 92 days. Yet they never recorded a single word she said. The reports were all about their physical experiments on her. It seemed clear that they didn't consider Plants like Knives, Tessla and I worthy of being heard or even permitted to live a normal life. We were seen merely as things to be used. They even seemed to think it acceptable to destroy one of us painfully, a little at a time. Oh, how those humans must have despised her, to treat her so badly! Surely, they would despise both Knives and me as they had despised her. I closed my eyes as tightly as I could. I clutched at my throat with one hand. The other hand was clenched into a fist. I felt as if I were spinning in null-gravity in the cryo-sleep area, except that everyone was awake and staring at me. I couldn't hide from their uncaring eyes, no matter how desperately I wished to do so. I wept. I didn't want to die as Tessla had. I didn't want that to happen to Knives, either. I hoped that the place where I had chosen to lock us away would conceal us until we starved to death. That seemed a kinder end than what Tessla had endured. Days passed, though in the unlit room time seemed to have lost all meaning. I'm not sure precisely how long it was, but I know that it must have been at least a few days. I became too weak to sit up unsupported or even crawl. That's when I heard you banging on the door. How had you found us? I thought I had turned off anything that would alert you to our presence. I must have missed something. I ignored your words. They hurt. I planned to die, so I saw no point in responding. I grew weaker as you continued to pound on the door, pleading with us to open it. As time passed, I fell over. I had grown too weak to sit up, even with the help of the wall. I hoped and prayed that the end would come soon. But you wouldn't allow that. You found a plasma cutter and made a hole in the door big enough to let yourself in. You took us out, to an infirmary. I still refused to eat, knocking the tray out of your hands. "You deceived us," I said. I'm ashamed as I recall those words, but my fears made me believe them at the time. "It's been one year, a perfect time for continuing what you started with her on us." "I'd never dream of such a thing!" you said. You looked shocked, and hurt. "Can you prove that you wouldn't do the same thing to us?" I said, shouting. "You people, who did that to her? How can you prove it?" The expression on your face should have been all the proof I needed. I'm so sorry, Rem. I wasn't seeing clearly at that time. You said, "I will never make that mistake again!" "Yes I am sure!" you said. "Don't mock what I went through. I never want to feel that way again, that horrible powerless feeling... I should have stopped it, by any means necessary. There isn't a single day when I haven't regretted it. That's why, when you two were born..."
"What!" you said. "What are you saying?" "Kill me," I repeated. "There's no one here but humans." "That's right," you said. "That's the way it is now, and that's the way it's going to be, too." I didn't appreciate your blunt honesty at that time. I felt surrounded, trapped. I wanted my pain to end, the pressure of the fears and the memories of the terribly heartless things done to Tessla. As I deteriorated, my desperation and madness grew. How long did I continue trying to starve myself to death? My mind became weak and weary. You never left my side, except to bring more food... which I kept refusing. The day came when you said I was going to eat, and you brought that rare fruit and peeled it. I focused on the knife, impatiently waiting for you to put it down. As soon as you did, I grabbed it and attempted to do what I had asked you to do. Again, you wouldn't let me. You cut your hand on the blade, when you caught it, to prevent me from harming myself. "That's your answer?" you said, staring at me sadly. "You're going to throw everything away so easily? You take yourself too lightly." That's when I did the one thing I now regret the most, of all the time when I knew you. I tore the knife from your grip, and I turned it against you. At first, I felt relief. It seemed like all that pressure, which had been crushing both my body and soul, was suddenly and completely melted away. You were such a strong woman! I knew it then, too. In that moment of madness, I thought that I wouldn't even shed a single tear. Looking at my bloody hands began to change my mind. Looking past them, and seeing you lying in a growing pool of your own blood, changed me more. I remembered the most important thing, which I had briefly forgotten. I remembered how much I loved you, and that you genuinely loved me. I dragged you onto a hospital bed, bandaged you, and began looking after you. I had to eat, and drink, to regain enough strength to take care of you properly. So I did it... not for myself, but for you. Again, time stretched out and seemed to become meaningless. At that time, it was not my own selfish misery causing time to slow its pace. Instead, it was concern for you that made each minute feel like an hour. Instead of being afraid for myself, I was afraid that you might never open your eyes again. I still have no words to express my relief when you finally woke up! You told me about Alex, and about your dream of riding on a train. You told me how my ticket to the future is always blank - wide open - and represents endless possibilities. I didn't completely understand it then. I don't deserve it now. That's when you asked me to promise I would never throw my life away, and I did. For you, I made that promise. It may be the only promise I am able to keep, Rem. As we finished speaking of all those things, that's when Knives woke up and said he was hungry. Even though he asked, you didn't tell him why you were also in a hospital bed. You sat down with us, and told us everything about the past: including Tessla's birth. You told us how you and William Conrad had opposed the ongoing experiments on her, and tried to stop them. You told us how you had violated the rules to protect us, and planned to smuggle us into the new world in a capsule with forged data. You spoke hopefully of our future lives, and your own resolution. Knives had listened, wide-eyed, as you spoke. Nothing you said seemed to have changed anything for him. It was as if he really had completely blocked out the memory of all we had learned, and seen, about Tessla. I thought it would be better for him to know the truth. Since you made such an effort to tell us everything, you probably thought the truth was best, also. The first time after that, when Knives wanted to go look at the cryo sleepers again, I hesitated. I was nervous that we might see Tessla again, or something else equally disturbing. I still don't know exactly what we saw, that led us to Tessla's remains. I only know that something, or someone, appeared there on that day. Knives said I shouldn't be afraid. Partly from his goading, and partly from a tiny bit of curiosity hiding behind all my discomfort, I joined him. We looked out over the sleeping people together. Nothing strange or unusual happened. Everything seemed as it had been, before the life-shattering discovery of Tessla and her fate. For months, our lives continued much as they had been before that painful discovery. You taught us to cook. We ate together. We played games together. You taught us. Knives and I continued visiting the observation balconies, and looking at all the people in cryo sleep. The sleeping people were as much a part of Seeds as you were, though you were their guardian while they slept. Until the day of the Great Fall. I remember yelling at Knives, after our escape pod crashed. "This is all your fault!" I said. "Rem, me... you deceived us, lied to us..."
"You shouldn't say such things," he said. "You may regret it. I simply made an extremely rational decision, and acted on it. What would it take to make the universe more beautiful, ya know?" "That's a lie," I said. "You really were afraid of them, of humans!" "No, the one who was scared was you!" he responded, kicking me in the face to punctuate his words. "Quit being so gullible! Weren't you paying attention? You need to look at the big picture..."
I have since studied the records. Approximately 80 million people were killed or lost because of the Great Fall. 802 ships were ruined, 124 went missing. Only 74 ships landed. Without your sacrifice, all would have perished. I don't know how many Plants were on each of the lost or destroyed ships. Probably at least one on each, which means that Knives killed at least 926 Plants that day and that at least 74 Plants survived because of your intervention. Did you somehow survive, as it appears that William Conrad did? If so, we still lost you. I never saw you again. It's been too many years, now... you weren't in cryo sleep, as he was. You couldn't have lived this long. My brother and I have been at odds ever since the Great Fall. We spent approximately eight decades traveling together, but we grew increasingly farther apart. I don't understand him anymore, Rem. I think we used to understand each other, but that changed after we discovered Tessla. I don't know what to do. I don't know how to help him. I don't want the things your shipmates did wrong, destroying Tessla's body, to continue destroying my brother's mind and soul. There has to be a way that I can reach him, and help him rediscover his better self. There has to be! I won't stop until I find it... or die trying. My ticket to the future... it's still blank, isn't it? I don't deserve it, but it appears as if I still have it. If I threw it away, that would hurt you. It would hurt you, just like when I tried to kill myself after finding Tessla... wouldn't it? For your sake, then, and for Knives' ... I won't allow myself to shrivel up and die. Not yet. I must try again to reach him, to help him. That is the only purpose I have left. I hope you would approve. Thank you for loving someone as ungrateful and unworthy as myself, back then. Don't worry - I don't expect it now. Author's note: Tessla's brief life was, according to the reports shown in the manga, from May 3, 2405 - December 18, 2405 (229 days). When the crew were awakened from cryo sleep, one of them complained that it hadn't even been three years since the last time they woke (implying it had been more than two and a half years). If that "last time they woke" was during Tessla's life, then the time when they woke on the twins' first birthday would be during the latter half of 2408. Is anyone aware of more precise canon information on Vash & Knives' birthday? I'm just curious. It may be useful in a story sometime. I do not own Vash "the Stampede," Rem Saverem, Meryl Stryfe, Milly Thompson, Nicholas D. Wolfwood, etc: they all belong to the incomparable Mr. Yasuhiro Nightow. This series of "Unwritten Letters" attempts to get inside of Vash's head, usually regarding the events in the manga (or anime). I will try to follow the chronology as closely as possible, and blend in Anime where the Manga is silent (though favoring Manga when ever there's conflicting information). I imagine that Vash would be someone who'd want to re-examine a day's events, and try to learn from any mistakes he made. Vash doesn't consistently have anyone around that he can talk with that honestly. So it occurs to me that Vash -might- compose letters in his mind as the way that he re-examines his day, unwinds, and learns any lessons he can from it. Most of these "unwritten" letters will be addressed to Rem. However, if it's about something I imagine Vash would think that someone else might understand better, he may address that one to someone else. The dates align with the manga. I use manga dates where they are given. Where dates are not given, I’m using my best guesstimate. I hope all who read this collection, or any part of it, will enjoy it. The entire collection of "Unwritten Letters" may be found in my gallery's "Unwritten Letters" folder. If anyone's curious, my other Trigun Fanfiction (most of which is not duplicate posted at DA) can be found through my profile at fanfiction.net. Note: There's no need for an account or to log in, just to read things posted at fanfiction.net. Several years ago, I was in a line at a second-hand store. Along with several others, I was waiting to for my turn to pay for my chosen items. The clerk at the cash register where my line led was a young girl wearing a maroon shirt. Her hair was dyed a bright purple that clashed rather badly with the color of her shirt. She didn't look very happy. I found myself feeling curious. If she liked maroon, why had she chosen to dye her hair purple instead of something like blue, or green, or pink, which would not clash? I pondered this as I waited my turn and moved forward in the line. I knew that most people appreciate it when someone takes an interest in them. I figured it might be reasonable to ask politely about her hair color choice. It might even cheer her up, to have someone show an interest in her as a person. I had done that before, cheering someone up by showing interest in them. It seemed worth a try then, also. I do not own Trigun / Vash, or any other characters from the anime or manga. They belong to the amazing Yasuhiro Nightow. Vash stared out through a window, considering the clouds in the early morning light. The suns were just peeking over the horizon. The suns' light seemed to be gilding all of the many wispy clouds this morning. Those clouds were probably dust instead of moisture, but, for the moment, they were beautiful. Visual beauty was, perhaps, the most fragile and fleeting thing in nature. He'd just finished washing up after his morning workout. His stomach rumbled, but he wanted to enjoy the fleeting beauty of the morning sky while it lasted. It was the 14th day of the third month, or 3.14. A few people (most of whom were teachers, scientists or engineers) still celebrated this date as "pi day." 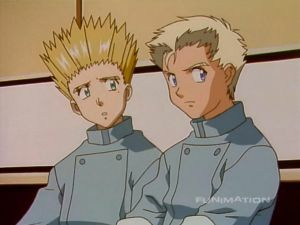 Note: I do not own Trigun / Vash "the Stampede" or Luida of Seeds: they belong to the incomparable Mr. Yasuhiro Nightow. And their friends who care enough to provide a safe place when they need one. Vash struggled to crawl, as the unfeeling sands slipped about beneath his hands and knees, and then out from under his forearms and knees. He had to get far enough away from that town to be unnoticed by any of its citizens when daylight arrived. He was so tired... his arms wobbled, and he fell flat on his face. Note: I do not own Trigun / Vash "the Stampede": he belongs to the incomparable Mr. Yasuhiro Nightow. Date: Star year 0155 month 6 day 2, approximately 1:38 a.m.
She couldn't help worrying about Vash. He was hugging her exactly as a frightened child would. She gently stroked his hair around his ears and temples, exactly as she did when comforting a frightened child. Her other hand rested on his forearm, where it was draped across her waist. She thought she felt a little moisture soaking through the fabric of her pajama top, on the shoulder where his head rested. 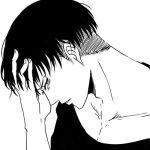 Try as he might, that was the last thing which Vash could remember before he found himself waking up here... wherever "here" was. He'd been crawling away from Tonim Town, and then he'd collapsed in the desert under the combined light of the distant moons. Going over such things in his mind brought him no nearer to understanding how he found himself wherever he was. It seemed as if he didn't have enough information to draw a conclusion. He opened his eyes, and frowned at the ceiling. Perhaps he should get up, get his gun, and look out of the window to see if he could recognize anything about the place? Vash's eyes snapped open. He was sitting rigidly upright, drenched with sweat, and breathing very heavily... as if he'd just been running for a considerable distance while in fear for his life. Adrenaline pulsed through his body. He found himself shaking, partly from the excess adrenaline, and partly from continuing the necessary internal efforts to completely contain his emotions. It would not do to broadcast his feelings to Knives. That could have grave consequences, which he currently felt ill equipped to face. He could not afford to be sloppy with his self-control, not now. He was sitting on a bed, in a darkened room. Your No.1 90s nostalgia trip!